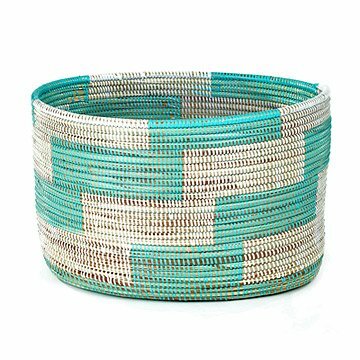 Bring eclectic flair to your home with this hand-woven basket, made in Senegal from cattails. Brimming with inspiration for your own knit creations, Leslie Mittelberg's vibrant basket offers all the eclectic flair of an open air bazaar. Perfect for holding colorful skeins of yarn or even a stack of your favorite glossy magazines, each basket is hand-woven in Senegal from cattails and plastic strips to bind them together. Keep next to the sofa, desk, or bed as a catchall that lends a bold pop of color. Handmade in Senegal. After being a world traveler for many years, Leslie Mittelberg stumbled upon Africa. As soon as she stepped onto the soil, she knew she was going to have a long-term love affair with this continent. The vast, wild and rich culture invaded her heart and forever altered her conservative mindset. She is blessed with both incredibly devoted suppliers and staff, all committed to the same cause. Their passion is to educate, improve livelihoods and bring independence to rural African communities. Her artist group is currently involved in direct product development work in Kenya, Tanzania, Uganda, Mozambique, South Africa, Ghana, Senegal, Mali, Burkina Faso and Sudan, and they are a proud member of the Fair Trade Federation. Was larger than expected, but will work fine. Very well made and attractive. I love this basket! It is very well made and roomy. I use it to hold my yarn for whatever knitting project I am working on. It is also beautiful. Larger than I expected but will easily hold my wife's knitting supplies with plenty of room left over. Very well made, fits with her knitting accessories.